Women and beauty can never go out of fashion. The goodness is always trending. But have the times changed? Are women getting busier day by day and starting to compromise on their skin care regime? Well, if not all a couple of them are. I am a woman and constantly under a dilemma whether the products I use are really nourishing my skin or am I just marginally increasing the sales of a particular brand. That’s when I connect with Shabia Walia, Founder of Tattva who proudly turns down the expensive labels as she manufactures her own. She is a mother and was enlightened to the damages caused due to the chemicals we intake in our daily lives with all that we consume be it skin care products or food. I couldn’t agree more with her. Her passion revolves around providing natural and best quality skin care products to women and moms who care for their skin. Read on to know more. I am a media professional having worked in television for the last 21 years in different capacities as a creative director, writer, script head, producer etc. I have also penned the bestselling book ‘Mamma Mania’ based on my pregnancy and motherhood experiences in 2011. 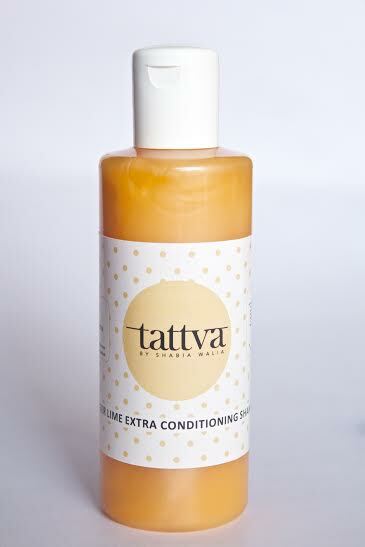 Last year an urge to do something of my own and alarmed by the number of chemicals in our body products, I started making my own natural body products which led to the launch of my entrepreneurial venture ‘Tattva’. Ever since, there is no looking back as Tattva scales new heights every day. From manufacturing products in my kitchen we have grown into a full fledged venture delivering products all over the country with a significant presence online, in different cities through retail, tying up with corporate and getting into the hotel toiletries space as well very soon. All this in a time span of less than a year. My husband travels a lot courtesy of his cinematography profession. He got me a wonderful body scrub from Fiji which I ran out of in December 2013. After hunting a lot for it or something similar, I came across one by a popular brand which was ridiculously expensive. I thought to myself, ‘A Sugar Scrub can’t cost so much! Everybody should able to afford this pampering if she chooses to.’ That’s when I decided to try to make my own body scrub. Egged on by my husband and father in law, over the next few days in January 2014 I read, researched, experimented and made my first ‘Cocoa Almond Body scrub’ for myself. Now I have always been concerned about the enormous amount of chemicals we put on our body everyday thanks to the body products we use. I told myself, “If I could do this as a business venture I would be killing two birds with one stone. I could stay close to my 5-year old daughter Sia and do this at my own pace and time. Most importantly I could do my bit to reducing harsh chemicals from my family’s lives and those of others who would choose to try my products since I was planning to make them with absolute natural and organic ingredients’. We started thinking of a name and it came to me in my sleep. My friend Tonya Kampani generously designed my logo and Thus ‘Tattva’ was born! Where does all the inspiration come from? Well, from various quarters I would say. A quote , an inspirational story of rags to riches, a motivational song, seeing the less privileged and their zest for life despite their handicaps, my daughters smile, the realization that life is too short, the want to travel more, the desire to lead a good life, to need to create something which becomes a legacy, the will to rise above the mundane, all this drives me to push myself to my maximum potential and limit. How do you manage yourself, family and work so efficiently? I not only balance my family and business, I also have a full fledged parallel career in television where I work as a creative consultant with various television channels and companies. I also blog about motherhood and living naturally, apart from being a very involved mother to a 6 year old daughter. I start my day early at 6 am and once I have packed my daughter off to school I work till 10. 30 am sorting out my mails, writing my blogs, going through my television scripts, figuring out that day’s deliveries and raising bills to my clients and stores. This is my most productive part of the day where I do a lot of thinking and planning post which I leave for my television meetings and my own office. I generally plan my schedule around my daughter’s school timings and try to return home by the time she is back. Alternatively I am home by evening when I have a hectic day nd I try and spend the rest of the evening with my daughter. My freelance cinematographer husband and my house help are my support system when I work. Generally I try and keep the weekends off and it all revolves around my family and friends. I take frequent holidays and go out for dinners very often to catch up with my family where we chat about us as a team. I have a very good set of friends too who help me with my business and are my bouncing boards. Payal Tyagi, owner of Indie Eco Candles and Ravi Bhushan, a television director are my go to people for everything from business issues to personal rantings. The key to multitasking is to divide your work well priority wise and plan well. A little bit of planning and scheduling keeps the stress away. Your take on the skin care product market in India? The skin care product market especially in terms of natural and organic products is still new and hence there is a lot of scope to grow. There is less awareness compared to the west where they are very conscious about adapting a natural lifestyle although natural living has its roots in India. Indians largely are still fighting the battle of the basics hence buying premium products which are good for them are still not top priority versus food, shelter and Clothing. However the scenario isn’t bleak and people are waking up to the dangers of chemicals and to the benefits of natural products. Also the laws in relation to the cosmetics industry are still vague and complicated. This proves to be a boon for the mischief mongers but a hurdle for the genuine ones. With the exposure to international products and their easy availability in Indian markets, consumers want more and the best for themselves. The earning capacity of our people has gone up and slowly the need to get quality for their bucks is also rising which is very encouraging for new brands like us. India is largely an unorganized market? Does this affect your brand? How? The fact that its unorganized has both its pitfalls and benefits too. Since its unorganized there is a scope to make a dent in an already existing market. Consumers are experimental and are willing to try out new products. You can try various ideas without being stuck with the formulas of an organized market. On the flipside, consumer behavior can be erratic. Licensing and distribution can be a pain. Getting skilled and efficient laborers and holding them back is a task. The red tape and difficulty in sourcing raw materials and eco- friendly packaging materials is difficult if not impossible. In addition for new entrepreneurs like me, its difficult to invest in expensive market research studies to know about consumer behavior. But in these pitfalls and disadvantages lie the challenges and the motivation to tackle them. When conventional ways are not available to you, you think of innovative ideas and that many a times, becomes your USP. How is being a CD different from being an Entrepreneur and how is that different from being a mother? Being a CD is being a leader, getting an entire team of skilled people or professionals to follow one direction and translating the channel’s vision into reality on screen. Being an entrepreneur is like being a leader, a worker, the delivery boy, the accountant all rolled into one. Unlike being a CD where you are following someone else’s vision along with a highly skilled team to back you, being an entrepreneur is about translation your own vision and ideas into reality which is the biggest kick. CD’s have mad schedules and the stress is high as we work on deadlines. Not to say, entrepreneurs don’t work hard or are not stressed but because you are your own boss working for yourself and chasing your own dream, its enjoyable. You can decide your own working hours and schedule though the flipside is every hour is a working hour as your dream consumes you and switching off is difficult. A CD can get multiple feedbacks from the channel etc and the money which is at stake is not yours, but when you are an entrepreneur its your money, your dreams, your brand at stake and every action of yours will have a reaction on you and your brand. So the responsibility is multifold and the bearer of the cross is you and you alone. What’s ahead in store at Tattva for the coming year/s? Tattva is growing organically and we are in no rush to expand vertically in terms of numbers. That said, we do have a lot of plans to get into more retail stores in India by setting up a distribution system, we want to go plastic free which is big on my agenda, exports is another arena where we have been getting a lot of enquiries for and is on our to do list this year. We recently incorporated a payment gateway on our website www.tattvabyshabiawalia.com and driving customer traffic to it is topmost priority. Apart from this, owning my own organic farm, a manufacturing unit closer to the city where we live and making Tattva a socially conscious organization are my long term plans for it. This year we have committed to donating a large part of our company’s proceeds to ‘The BlueBells Community’, a non profitable venture started by me to support various NGO’s across the city in achieving their goals. We are the messengers. We take help from where it’s available and make sure it reaches where its needed. The community is an organic derivative of Tattva and I hope to make it a ‘go to’ destination for anyone who wishes to help or needs help. Would you like to give some advice to aspiring women entrepreneurs / mompreneurs? Women have a multitasking device already fitted into their dna. This gives us an edge over our male counterparts to whom this does not come naturally. Make use of this device. Switch off from other tasks and concentrate on the one at hand. This leads to more efficiency and better output. Believe in your product. If you don’t, no one else will. Create a great product and market it well. Never shy away from talking about your achievements. They tell your customers what you are made of and help in them having faith in your brand. Be true to your product and customers. Accept mistakes with grace and do what you can to correct them. Be the face of your brand. If your customers feel they know you, they are more likely to invest in your product. Personalized service is what separates us entrepreneurs from the big organizations which are faceless. You are the biggest ambassador of your brand. Be proud of it and show it. Last but not the least, give back a part of all that you have got from the universe. Its the only secret to abundance in your own life besides the joy of bringing a smile on someone else’s face. Would you like to share some of your products with our readers? If yes you can list a couple of them below with an image, description and price details. An exfoliating and moisturizing body scrub with the goodness of almond oil and cinnamon drizzled with the fragrance of vanilla. It’s a super start to a day. Ginger Lime is an all natural shampoo for healthy and natural hair. Made with all natural ingredients and no harmful chemicals, this one leaves your hair smooth and soft. You can feel the tingle in your scalp every time you wash your hair. Ginger Lime is a ‘Tattva’ bestseller. Our Cinnamon Black Pepper Soaps are a hot favorite of both men and women. These soaps are cold processed by using supreme quality cinnamon and black pepper and are beneficial for skin infections, acne, skin burns & wounds. Give your mornings a spicy treat. If your brand/product or service offers something unique about India/to India and if you would like to feature your brand with us, you can write in to us at alivindia99@gmail.com and we will get in touch with you. Till then #StayAliv.